Customer expectations to have optimal experiences on today’s websites and mobile applications are soaring, and more and more customers are quick to abandon a site if they do not immediately find it engaging or cannot quickly locate what they are looking for. But, how do you know if your site is optimized to instantly engage customers and designed to readily meet their needs? How does click behavior differ on your site for those customers who abandon versus those who purchase? While web analytics can identify what pages your customers click on, applying usability analytics such as heat maps allows you to view where customers are interacting with your pages and understand customer behaviors for different segments. Armed with this increased insight, you are better equipped to implement design and layout changes to optimize your site, improve engagements and conversions and enhance customer experiences. A heat map overlay identifies regions of a page where customers either click or hover or hover to click. Heat maps are very useful in identifying high and low interest areas on a page and helping you recognize usability issues in the page design. 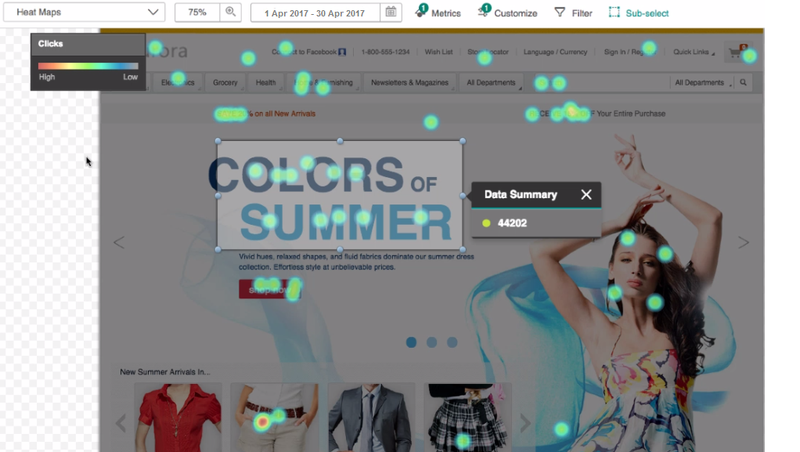 By implementing heat map analysis from Tealeaf cxOverstat available with IBM Watson CXA, and applying dimensions to filter the report data by different segments of customers, you can understand where customers engage the most on your page and uncover design flaws that may be causing customer struggles – and abandonments --on your site. Identify content areas on your pages that are of the most interest to customers and areas that may be causing confusion or struggles on your pages. Uncover usability and design flaws on your site for increased visibility into areas requiring improvements and fine-tuning. Facilitates optimal design elements that can improve engagements, maximize conversions and optimize customer experiences. This customer experience analytics (CXA) formula will assist you with using heat maps analytics available in Watson CXA to view and compare customer interaction rates on areas of a page to identify the content areas that are the most engaging to customers and the areas that may be causing struggles. The formula will then illustrate how applying dimensions to filter the data by different segments allows you to further evaluate customer behaviors and understand if your site design is optimal or if usability improvements are needed to enhance customer experiences and increase conversions. Select a page snapshot to evaluate -- your home page, product page or even a campaign page would be good options – and select it from the Snapshot Gallery. Select Heat map report from the list of available overlays. Select the magnifying glass icon from the top tool bar to adjust the zoom and resize the page to ensure it is viewable on your screen, if necessary. In viewing the heat maps report, the red indicates areas of high customer interactions and the blue indicates areas of low customer interactions, allowing you to quickly view where customers are interacting with your page. Do you see a high number of customer interactions on areas of the page that you wouldn’t expect? Are most customers clicking where you intended with your page design? Drag the sub-select box over the area of the page you would like to investigate The sub-select tool will then display the data summary showing number of customers who clicked on the area you have selected. Drag the sub-select box over additional areas of the page to compare data. Comparing interactions with the number of customers who clicked on different areas of your page can help you identify if customers are clicking where you expected or intended on your page. For example, do you observe a lower click rate on your linked buttons or text? But, then discover a higher click rate on unlinked text? If so, perhaps there is a design flaw with your page that is causing customer struggle and confusion. By visualizing where customers click the most on your pages, you can optimize content and link placement to increase engagements and maximize conversions. 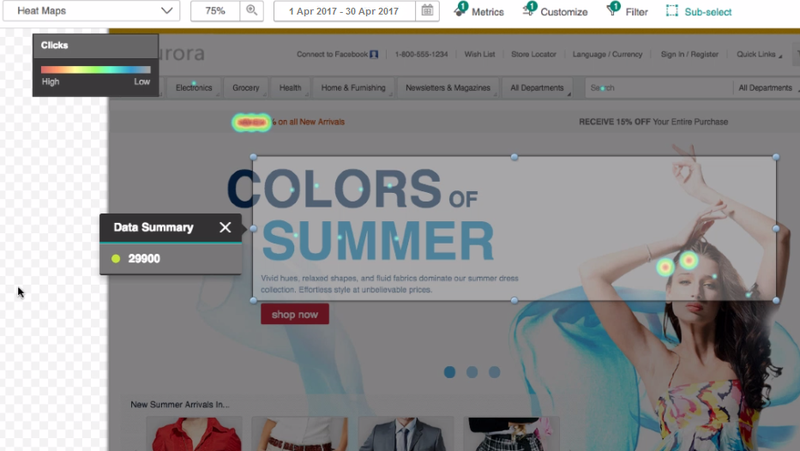 To better understand how your page design is impacting customer behavior for different segments, you can apply dimensions to the heat map overlay data to filter the report by a specific dimension value. For example, applying dimensions to segment mobile customers and desktop web customers to better understand how each user is engaging with your pages can offer you the opportunity to optimize your site for all customers. Do you see higher interactions on your linked text for desktop web customers compared to mobile customers? Could some design changes make it easier for your mobile customers to find important information on your page? A deeper understanding of customer behavior relative to different segments can help you identify where particular customers struggle and others succeed. Viewing the heat map overlay data report, select the filter icon (on upper tool bar) to see a list of dimensions for the data. Select a dimension group. For this analysis, select Overstat-goals – heat map and then purchase success. Select a dimension value. For this analysis, select abandoned as the dimension value, as we want to segment the customers who abandoned without purchasing. Click filter and the report snapshot updates to display only the interactions of customers who clicked on the page and then abandoned the session without making a purchase. To quantify the data, select the sub-select tool and drag the sub-select box over the areas of interaction you want to evaluate. The data summary will show the number of customers who interacted on the page and then abandoned without converting. Updated heat map report showing interactions for those customers who interacted on the page and then abandoned without purchasing. Data summary display quantifies users who clicked on center of page and abandoned without purchasing. 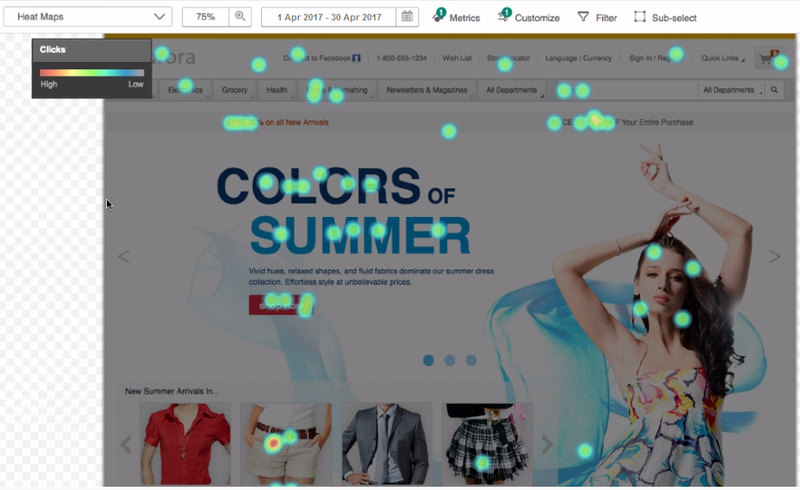 Applying usability analysis like heat maps allows you to easily see areas of high – and low – interest on your pages by identifying the intensity of customer interactions. Understanding where customers tend to focus on your pages can allow you to implement important design changes – like repositioning links on a page, redesigning a link button or modifying content placement -- that can directly improve brand engagement and increase conversions. Recognizing what content your customers are engaging with the most also offers you the opportunity to customize and make your pages more personal for your customers. Finally, on-going monitoring of customer interactions on your pages allows you to fine-tune and maintain optimal design elements and continually enhance customer experiences. The CXA Formula Blog is designed to provide formulas or recipes in using IBM Watson Customer Experience Analytics and Tealeaf CX on Cloud. This includes formulas in digital analysis, customer experience analytics, journey analytics, and Universal Behavior Exchange. These formulas are designed to provide you insight and best practices in customer analytics.